We are currently in a digital content era. With the increase in circulation of multimedia content globally via the internet it has lead to the need for reuse of content stored in archives; the utilisation of newly stored materials; partially finished broadcasting programmes and finished content. This book proposes to show solutions to these numerous content issues. It will discuss large scale archives for significant content and a retrieval method for large scale archives and remote editing. The book will also examine the protection of intellectual property rights, which is one of the most important issues facing content owners. A resource that all broadcast engineers, systems integrators and engineers for equipment manufacturers will find invaluable. 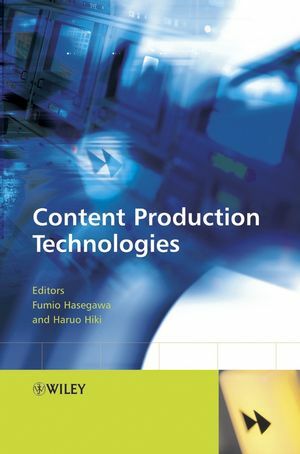 The thorough approach to this topic ensures that this title will become the standard reference for R&D specialists in content production and digital archiving. Fumio received an MSc from the University of Electro-Communications and joined the Shimizu Corporation in 1974. In 1986 he received a DEng from the University of Tokyo and was a visiting researcher at MIT (Massachusetts Institute of Technology). In 1989 he became an assistant professor at the University of Tokyo. He was the Leader of the R&D project at the Yamagata Video Archive Research Center (YRC) of the Telecommunications Advancement Organization of Japan (TAO) from April 1999 to march 2003 and is now the senior director of the graduate school at the Tohoku University of Art and Design. Haruo graduated from the University of Electro-Communications and joined the Sony Corporation VTR Development Division in 1965. For 20 years he worked on many aspects of R&D for video camera, VTR and video-editing system in PAL, SECAM, and NTSC, which included R&D in Paris for 7 years. Then he worked in the personal computer field for 5 years and in the digital interface standardization field for a further 5 years. He was a senior researcher at YRC/TAO from April 1999 to March 2003, where he was in charge of network-based editing technology in the R&D project, 'Fundamental Technology of Broadcasting Program Production with Large-scale Video Archives'. He is now a free lance journalist for archival production. 1. What is a Large-scale Archive? 2. Content Production from Digital Archives. 4. Experiment for Content Production with Content ID and MPEG-7. 5. New Content Production and Distribution Environment. 6. Recap and the Future. 7. Utilization and Systematization of Video Assets.